cows. The farm offers visitors the opportunity to see all aspects of production agriculture, from row-crop agriculture to livestock, including a robotic dairy, as well as hogs, chickens and goats. DONAHUE, Iowa — John Maxwell admits it: There are times he’d rather be somewhere else. “There are times when I’m giving a tour when I’d rather be planting corn, but you find time for everything,” he said. On his Cinnamon Ridge farm in rural Donahue, Iowa, not too far from the Quad Cities, Maxwell has combined a love of agriculture and farming with some serious “people” skills to put production agriculture on full display— literally — for the world. “I listen to people,” he said. Maxwell has a degree in psychology and started farming in 1984, purchasing his first farm in 1987. He built the house where he lives today and moved there in 1994. What he heard from John Deere after he won the National Outstanding Young Farmer Award in 1997 was that they were looking for a farm close to their Moline world headquarters to satisfy their foreign visitors and customers’ desire to see a real, working American farm. He had been providing tours of the farm for local schoolchildren, including his daughter Amy’s preschool class. “I’m not afraid to take a risk,” said Maxwell, so he did and opened the working farm to the Deere tours. He has expanded from there, providing tours as requested for guests hosted by other agribusinesses. He also has branched out and works with foreign tour and travel companies. In a year, Maxwell and Cinnamon Ridge Farm will host from 2,500 to 3,000 guests. When guests arrive, they pass the small Country Cupboard country store where various wares from the farm are sold on the honor system. They then wind up the long lane toward the large dairy barn and massive grey-blue house that crown the hill. The farm is named for the ridge that overlooks where the Mississippi River once flowed before the glaciers moved things around. The“cinnamon” is the color of the herd of Jerseys. The dairy is managed by John’s daughter, Amy, now an Iowa State University graduate, who milks around 120 cows in a robotic milking system. “You have to like being around people,” said Maxwell, and he clearly enjoys people. The farm is a true working farm. Maxwell farms 4,000 acres of corn and soybeans, has a 40-head cow-calf beef herd and feeds dairy steers. 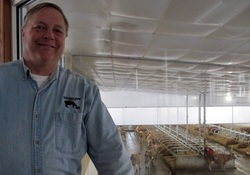 He leases two wean-to-finish hog barns that produce about 10,000 hogs a year. He has 400 head of chickens and sells eggs from them and also has 30 head of goats. 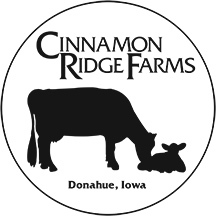 Eight employees, including Maxwell himself, keep Cinnamon Ridge Farm running as a working farm and as a tour destination. Maxwell leads the tours, but it’s not unusual to find him working on other parts of the farm. He said he usually does at least half the spring planting himself. “Everything done on this farm, I can do,” he said. His first job, he said, is to provide his guests a quality tour. It’s a duty he takes seriously. “They want to talk to the person that makes things work. They want to talk to the farmer,” Maxwell said. When he started, meals were not part of the tour. But guests were so enchanted with Cinnamon Ridge Farms and with Maxwell’s friendly manner that they began requesting more. “They told me ‘I would love to see the inside of your home. I would love to have a home-cooked meal,’” Maxwell said. He obliged them, and today the restaurant-certified kitchen in the first floor of the house he built and lives in turns out meals for guests, who can dine on fare such as baked chicken, grilled pork chops and roast beef, as well as homemade bread and baked goods, in the spacious dining room on the first floor. A cathedral ceiling in the house lets in light and sweeping views of the Iowa landscape surrounding the house. Pictures of daughters Amy and Kara, a student at Iowa State University, adorn the walls of the house. It is here that the tours begin, after introductions from Maxwell. The tours encompass the entire farm experience. Maxwell explains to guests how the corn and soybeans grown on the farm work into the diets of the livestock there. The operation of a working grain and livestock farm that also is a popular tour destination can present its challenges. “Mother Nature is always a challenge,” said Maxwell, who always finds a way to make the tours work, regardless of the weather or the season. He said he can tailor tours to what groups and tour operators want, for instance, if groups want to see farm equipment at work or see how biotechnology is used or if a group wants to see livestock farming. Spring and fall bring students from local schools, and the tours of foreign guests arrive on a year-round basis. One of the new tools in his Cinnamon Ridge tool belt is a large conference and reception space in the farm’s new dairy barn. The barn will hold 275 head of Jersey cows when it is completed. The room will be available for meetings, conferences and family events, such as destination wedding receptions, graduation celebrations and anniversary parties. The room features large windows that look down on the Jersey herd as they go about their daily routine. Some cows nap on the bed of sand inside the barn. Others wander over to the large rotating brushes spaced around the barn to get some combination grooming and back-scratching. Still, others line up to wait their turn in the robotic milker. The technology itself is a novelty on the farm. A large window on the first floor of the barn gives guests a view of a cow in the milker that milks each cow and measures not just milk output, but physical traits, as well. Amy studies those reports to monitor the health and the milk production of the herd. To get ready for a tour involves more than walking out the door to await the tour buses, with Maxwell being accompanied by dog Fritz. “There are 20 man-hours in a meal alone, and it’s two to four hours of prep for a tour,” Maxwell said. But he doesn’t mind the work because he loves all parts of his job, from farmer to tour guide. “There is nothing better than to be self-employed,” he said. learn a lot, also,” he said. unique in his desire to share his farm’s story. positive light, that’s a good thing,” he said.